Proof of burns have been used to accomplish multiples of things for multiples of projects, but in short Proof of Burn is a consensus model to substitute Proof of Work and serves to burn coins or tokens for some purpose like burn unsold ICO tokens. Once funds are sent there you cannot withdraw them and they are technically taken out of the circulation or simply “burnt”. These addresses only have a public key and the private key is unknown so it is not possible to withdraw funds. This type of addresses may have many different names and usually contain some specific words like Burn DontSendHere, BitcoinEater etc. Proof of Burn can be used to fortify long term investor commitment to a project as it can stabilize and increase price overtime and major entities like Ripple and Binance use different forms of PoB for their coins. The previously mentioned burning of unsold ICO tokens might be the most popular kind of PoB as many ICOs have taken this route, such as Counterparty. During their statement as to why they were doing the proof of burn they had this to say. 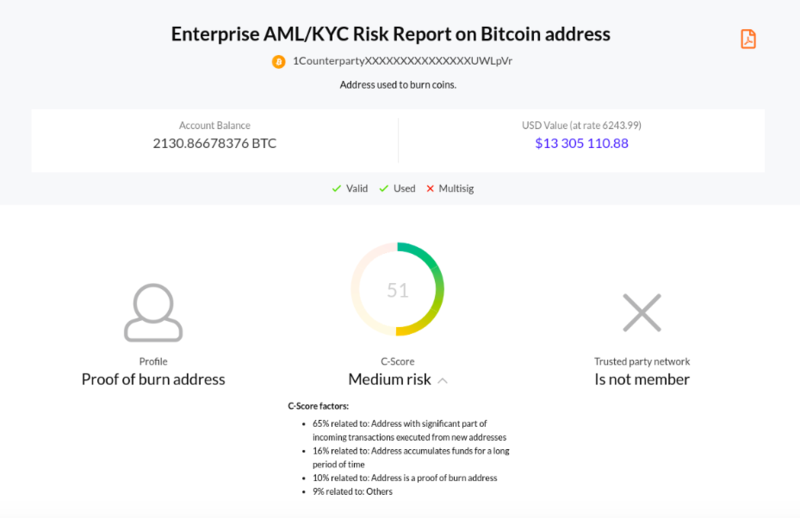 Below we documented through our AML Risk Reports how a proof of burn address looks and works within our Platform and the AMLT Network. In this case either the Counterparty team or a user of theirs would report the proof of burn address into the AMLT Network. After analysis, and if deemed to be correct, the data we would implement would be reflected in the AML Risk Report, potentially preventing any party from accidentally sending their funds there. In case you don't see the AML/KYC risk report below click here.